A Calling to the Dead! Contrary to what you might hear, we’re still pretty frickin awesome and we couldn’t do this without you and all your tasty friends. 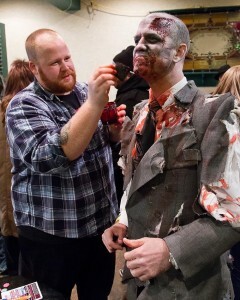 Feel like stepping up your zombieness this year with a touch of volunteerism? We have a special place in our stomach for you people. We are dying to have you help us. You can do most of these in costume and you get free makeup, free parade registration, a free keg beer at the after party (over 21) and other brainy stuff for volunteers plus invited to a thank you party in Nov.
Be watching for information on how to sign up to volunteer for this year’s Zombie Walk! !